PO2:Problem analysis: Identify, formulate, review research literature, and analyze complex engineering problems reaching substantiated conclusions using first principles of mathematics, natural sciences, and engineering sciences. PO3:Design/development of solutions: Design solutions for complex engineering problems and design system components or processes that meet the specified needs with appropriate consideration for the public health and safety, and the cultural, societal, and environmental considerations. PO4:Conduct investigations of complex problems: Use research-based knowledge and research methods including design of experiments, analysis and interpretation of data, and synthesis of the information to provide valid conclusions. PO5:Modern tool usage: Create, select, and apply appropriate techniques, resources, and modern engineering and IT tools including prediction and modeling to complex engineering activities with an understanding of the limitations. PO6:The engineer and society: Apply reasoning informed by the contextual knowledge to assess societal, health, safety, legal and cultural issues and the consequent responsibilities relevant to the professional engineering practice. PO7:Environment and sustainability: Understand theimpact of the professional engineering solutions in societal and environmental contexts, and demonstrate the knowledge of, and need for sustainable development. PO8:Ethics: Apply ethical principles and commit to professional ethics and responsibilities and norms of the engineering practice. PO9:Individual and team work: Function effectively as an individual, and as a member or leader in diverse teams, and in multidisciplinary settings. PO10:Communication: Communicate effectively on complex engineering activities with the engineering community and with society at large, such as, being able to comprehend and write effective reports and design documentation, make effective presentations, and give and receive clear instructions. PSO1 Enable students to design system and system architecture, inculcating software, computing and analytical ability. PSO2 Enhance skills to be successful in National, International level competition like GATE, GRE, GMAT. The chart below gives the distribution of course contents representing blending of subjects of different skill areas of the UG Course. To exhibit both analytical and synthetical skills. To create Databases with different types of Integrity Constraints and use the SQL commands such as DDL, DML, DCL, TCL to access data from database objects. To learn the use of a Front End tool like VB. To learn the fundamentals of Shell Scripting. To write simple Lex and Yacc programs to implement Language Grammar. To develop and test programs in C / C++ using Open GL functions to implement standard line clipping and polygon filling algorithms. To write programs to understand various transformations. To develop and execute algorithms at Data Link Layer, NetworkLlayer, Cryptographic Algorithm, Socket Programming with IPC Communication. Simulation of various Network Topologies and LAN technologies using NCTUNS. To design, develop and execute POSIX compliant programs related to operating systems, like IPC, Race Condition, Process Status, System Calls, etc. To understand and implement the properties of various data structures like arrays, stacks, queues, linked lists and trees. To achieve knowledge of Design and Development of Problem Solving Skills. Acer Desktop PIV, 2.66 GHz AMD Athlon Dual Core Processor, 512 MB RAM, 80 GB HDD. ALS – NIFC-39 Matrix Keyboard 3X8 Interface. 62 MBPS of Internet Bandwidth is supported by an IBM Server configured to be accessed on both LAN and Wi-Fi. Aplab 15 KVA, 3 ph-1ph providing backup for Server Room , Lab 1 , Lab 2, Lab 3 and Lab 4. Aplab 10 KVA 3 ph-1ph providing backup for Lab5, Lab 6. Tutorial Rooms are supported with White Board and with sitting capacity of 30. MEMORANDUM OF UNDERSTANDING (MoU) made between GSSSIETW, Mysuru and Allinnov Research & Development Pvt. Ltd., Mysuru, held on 14th March 2018. From Left: Mr. R K Bharath, CEO and Board Member, GSSSIETW, Mysuru, Dr. Shivakumar M, Principal, GSSSIETW, Mysuru, Mr. B Rama Krishnan, Branch Head, Allinnov R&D Pvt. Ltd., Mysuru, Mrs .S Gowthami, Allinnov R&D Pvt. 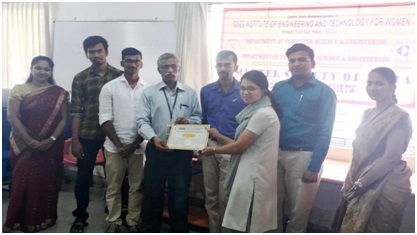 Ltd., Mysuru, Dr. S. Meenakshi Sundaram, Professor & Head, CSE, GSSSIETW, Mysuru, Dr. Nandakumar A N, Professor, CSE, GSSSIETW, Mysuru, Dr. P Raviraj, Professor, CSE, GSSSIETW, Mysuru and Mr. Gururaj K S, Associate Professor, CSE, GSSSIETW, Mysuru. To bring in motivation and support to the students of GSSSIETW for development of novel, innovative and patentable products, a Memorandum of Understanding (MoU) was formally signed between GSSS Institute of Engineering and Technology for Women (GSSSIETW), Mysuru and Allinnov R&D Pvt. Ltd., Mysuru. The signing of MoU was organized by the Department of Computer Science & Engineering on 14th March 2018. The MoU was signed by Dr. Shivakumar M, Principal, GSSSIETW, Mysuru, and Mr. B Rama Krishnan, Branch Head, Allinnov R&D Pvt. Ltd., Mysuru in presence of Mr. R K Bharath, CEO and Management Committee Member, GSSSIETW, Mysuru, Dr. S Meenakshi Sundaram, Professor and Head Department of CSE, GSSSIETW, Mysuru and Mrs. S Gowthami, Allinnov R&D Pvt. Ltd, Mysuru. Allinnov Research and Development Pvt. Ltd., start up in 2015, is said to be the first of its kind in India offering patent landscape analysis, patent filing, product research and development .It has got patents for its innovative products like toothpaste dispensing toothbrush, self-charging phones, self-heating coffee mugs etc. The young company has already been awarded two national awards – National Intellectual Property Awards for 2017 and Indian leaders for Industrial Empowerment 2016. Allinnov has more than 35 patents to its credit and has created more than 500 certified inventors worldwide. The objective of MoU is to collaborate between GSSSIETW, Mysuru and Allinnov R&D Pvt. Ltd., Mysuru to bring out new innovations and inventions from students and faculties of the Institution, for product development and to work together in the aspect of creating a good intellectual property reserve. Software Testing Lab at Department of Computer Science & Engineering, Memorandum of Understanding (MOU) was formally signed between GSSS Institute of Engineering and Technology for Women (GSSSIETW), Mysuru and iQuest Technologies LLP, Mysuru. The signatories of the MOU were Dr. Sumithra Devi K A, Principal, GSSSIETW, Dr. S Meenakshi Sundaram, Professor and Head Department of CSE, GSSSIETW, Dr. Reshma Banu, Professor and Head, Department of ISE, GSSSIETW, Mr K S Manjunatha, Founder & CEO, iQuest Technologies LLP, Mysuru, Mr. R K Bharath, CEO and Management Committee Member, GSSSIETW, Mysuru. Initiated a progress with TechPledge Consulting Service to supports Projects and Internships for the institution along with Technical Support like Seminars etc. MOU of Campus connect program between Infosys Ltd and GSSSIETW was renewed on 27th April 2015 for a period of two years. Faculties have been trained in the Deep Dive Faculty Enablement Foundation Program 4.0. 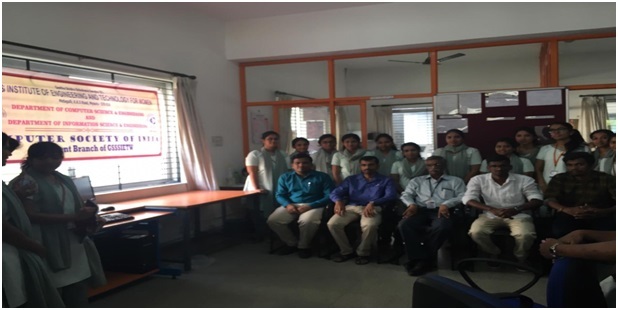 Campus Connect training has been conducted by our faculty for the students of all departments of our college from the year 2010 till date and final year students of all Departments of our college attended Campus Connect Foundation Program 4.0 training from Jan 2015 to Dec 2015. Dr.Dayananda R B, Associate Professor & Head, CSE, GSSSIETW and Mr. Rajath A N, SPOC of Campus Connect, GSSSIETW receiving the award for outstanding contribution in rolling out foundation program 4.0 from Sudhir Mishra, Geo Lead-Talent acquisition, Infosys. Wipro supports Projects and Internships for the institution along with Technical Support like Seminars, Workshops and Conference. Smt. Sujatha Visweswara, Vice President, Healthcare and Life Sciences, Wipro, Bengaluru has signed LOE and delivered talk on “Present and Future trends in Information Technology”. EMC provides regular industry update, presentation and online video from industries highly experienced experts by sharing their experience on different IT platforms, EMC academic alliance weekly newsletter and WEBINAR Series. An initiative of National Mission on Education, through ICT, MHRD, Govt. of India, conducted by IIT Bombay. Students of IV and VI semester are currently undergoing online training in PHP & MYSQL and PYTHON respectively. Every year since 2010, in collaboration with Govt. of Karnataka, the department conducts “Students Internet World” (“Vidhyarthigala Antharjaala Prapancha” ) , a programme to create Internet Awareness among the rural and Government school children, in and around Mysore. The Department of Computer Science & Engineering organized a One Day “3rd National Conference on Image Processing, Computing, Communication, Networking and Data Analytics (NCICCNDA 2017)” on 28th April 2018. This was organized in association with CSI Mysore & Bangalore Chapters, Conference proceedings Publication partner AIJR (Advanced International Journal of Research), technically co-sponsored by IEEE Bangalore Section. Research Scholars, PG Students and Faculty members from various institutions participated in the Conference. The Programme was inaugurated by the Chief Guest Dr. Pradeep Desai, CEO, Thalesat Innovations Private Limited, Bengaluru and Guest of Honor Sri. Kalose. S. Rama Rao, former Senior Project Manager, L&T Infotech Ltd, Bengaluru, in the presence of Sri. 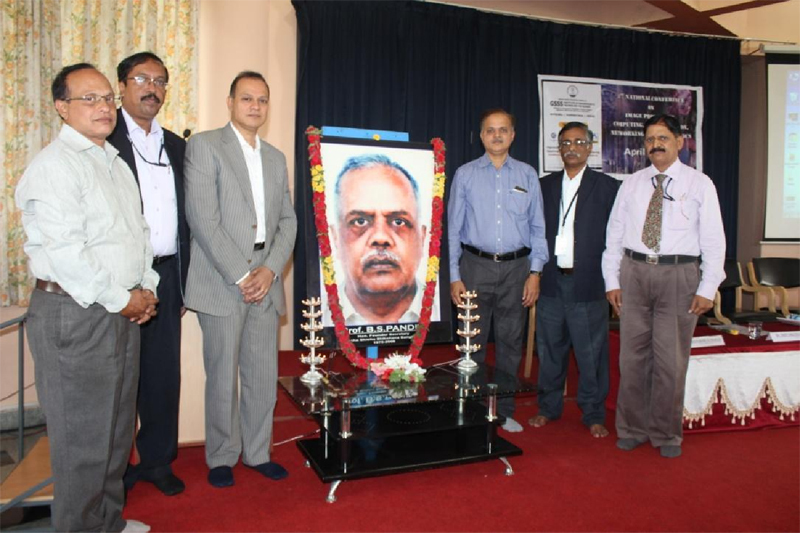 R K Bharath, Member & CEO, GSSS®, Mysuru, Dr. Shivakumar M, Principal, GSSSIETW, Mysuru, Dr. S Meenakshi Sundaram, Professor & Head, Department of Computer Science & Engineering, GSSSIETW, Mysuru and Dr. Nanda Kumar A N, Professor, Department of Computer Science & Engineering, GSSSIETW, Mysuru. From Left: Sri. Kalose. S. Rama Rao, Former Senior Project Manager, L&T Infotech Ltd, Bengaluru, Dr. Shivakumar M, Principal, GSSSIETW, Mysuru, Dr. Pradeep Desai, CEO, Thalesat Innovations Private Limited, Bengaluru, Sri R K Bharath, Member & CEO, GSSS®, Mysuru, Dr. S Meenakshi Sundaram, Professor & Head, Department of Computer Science & Engineering, GSSSIETW, Mysuru, and Dr. Nanda Kumar A N, Professor, Department of Computer Science & Engineering, GSSSIETW, Mysuru. The Chief Guest in his address gave the importance of research, how to choose the right topic wisely and present day challenges in the Industry. The Guest of honor gave the recent practices in Project Management, importance of SAP, Oracle financials, agile and scrum technologies. 103 papers were presented in the Conference in five session tracks namely Machine learning, Data Analytics and image Processing, Networking and IoT, Android and Smart applications and Mobile Applications and RFID. Research Scholars, Faculty members and PG students from Engineering Colleges from Tamil Nadu, Telangana, and Karnataka presented their papers. The Conference was organized with a Go Green theme and wide publicity was provided to all the stake holders through means of e-publicity, without printing of Posters and banners. The Department of Computer Science & Engineering organized a National Level Technical Competition “TECHNO SPECTRUM-2018”, in association with IEEE Bangalore Chapter on 04th April 2018. The Program was inaugurated by Chief Guest Mr. Prajith Nair, Product Lead and Solution Architect, Infosys Ltd., Mysuru in the presence of Dr. Shivakumar M, Principal, GSSSIETW, Mysuru, Dr. S Meenakshi Sundaram, Professor & Head, Department of Computer Science & Engineering, GSSSIETW, Mysuru, convenor Dr. Raviraj P, Professor, Department of Computer Science & Engineering, GSSSIETW, Mysuru. Hands-On Sessions by Mr.Rajath A N, Assistant Professor, Mrs Rummana Firdaus, Assistant Professor, Mrs.Usha Rani J, Assistant Professor Department of CSE, GSSSIETW was conducted from 10thJan 2018 to 28th April 2018 (7 Days of Working Saturdays) for 2019 passing out batch. 1 Technical talk on “Basics of Java” Pradeep, Software Engineer L & T, Mysuru 3rd March 2018. 4 Hands on session on “Operating System installation, RAID configurations, Open SSH applications and file system types” Mr. Manjuprasad B, Assistant Professor, Dept of CSE, GSSSIETW Mysuru 17th November 2017. Mr.Amit Thool, Managing Director, Dalvik Apps & Skillrex Technology, Mumbai, Mr. Sampuran Singh, Managing Director, Motivational Speaker of Dalvik Apps. Mr.Vijaya Kumar, SPI, Mysuru 10th September, 2016. 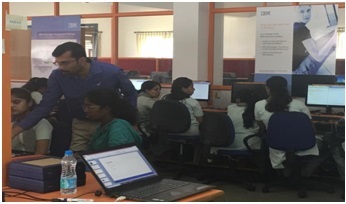 10 Workshop on “IBM Blueminx” Mr. Sachin Kumar R S, Community Manager, IBM Global Entrepreneur Program, Bengaluru 12th Apr 2016. 16 Technical talk on “Oracle Apps SCM (Supply Chain Management) & WMS (Warehouse Management System) - How it is used in our day- to-day life and its effectiveness” Praveen Natarajan, Team Lead, Software Paradigms International, Mysuru 27th Feb 2016. 17 Technical talk on “Data Transmission using Bluetooth Technology” Mr.Suresh, Senior Engineer, Qualcomm, Bengaluru 13th Feb 2016. 18 Technical Talk about “Advanced C Programming” Vijaya Kumar R, Senior Test Analyst, Software Paradigms Infotech Pvt Ltd, Mysuru 13th Feb 2016. 20 One day road show on “Internet of Things (IoT) Products” Mr. Ramraj Srinivasan, CEO, PREVA Systems Ltd, Bengaluru 9th Feb 2016. Senior Software Engineer, SPI, Mysuru. 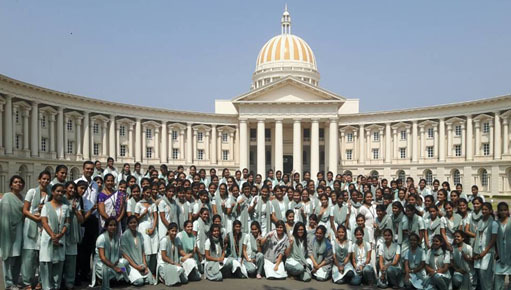 Department has a student association named ARCS (Association of Rising Computer science Students) which was formed in the year 2011. To promote team building activities that is required for working effectively in small diverse groups. To plan and organize activities like Technical / Personality Development Workshops, Seminars, Industry Visits, etc. To provide a platform for students to interact with eminent Academicians, Industry and Research Professionals. ARChiS, the Newsletter of the Department is released in May every year to showcase the activities of the department. 3 Presented a paper titled “Open-Source Tools and Networking Concept for Cluster Computing”, at Symposium on Networking organized by VVCE Mysore, Afrin Salma H K, Bhargavi N Dikshith, Chandrakala N, Kavya K P March 2018. 11 Participated in the One Day National Seminar on “Indian Language Computing” organized at Golden Jubilee Auditorium, S J College of Engineering, Mysuru in association with CSI, Mysore Chapter Apoorva M S, Nisarga S, Inchara M, Kavana H A, Neha R, Anushree J, Bhumika M, Rachana N Ghanathe, Pavithra V Bhat, Shrutha K students of 6th semester 27th March 2018. 12 Participated in one day National Seminar on “Indian Language Computing”, organized by CSI Mysore Chapter Neha R 27th March 2018. 13 Won 2nd place in Collage conducted as a part of Techno- Cultural Fest, at GSSSIETW Mysuru Pranitha R 22nd to 24th March 2018. 16 Won 1st Prize in “Technical Quiz” and 2nd Prize in “Coding” in “CSI National Level Student Convention” organized by CSI Student Branch of Sri Ramakrishna Engineering College (SREC), Coimbatore Divya Chatty 16th & 17th of March 2018. 17 Won 1st Prize in Technical Quiz in “CSI National Level Student Convention” organized by CSI Student Branch of Sri Ramakrishna Engineering College (SREC), Coimbatore on Aparna S Bandekar 16th & 17th of March 2018. 18 Won 2nd Prize in Treasure Hunt in “CSI National Level Student Convention” organized by CSI Student Branch of Sri Ramakrishna Engineering College (SREC), Coimbatore Sushma K R & Srishti Maru 16th & 17th of March 2018. 19 Won 3rd Prize in Coding in “CSI National Level Student Convention” organized by CSI Student Branch of Sri Ramakrishna Engineering College (SREC), Coimbatore, on Simran Goyal 16th & 17th of March 2018. 20 Awarded as “Start of the event”, conducted as a part of CSI National level student convention- techstrom, at Sri Ramakrishna Engineering College Coimbatore Divya Chatty on 16th &17th March 2018. 21 Participated in Code Mania & Quiz, conducted as a part of CSI National level student convention- techstrom, at Sri Ramakrishna Engineering College Coimbatore Sneha G P, Nagalakshmi, Mayuri H, Sushma K R, Sushma K R 16th &17th March 2018. 22 Participated in Paper prese ntation , conducted as a part of CSI National level student convention- Techstrom, at Sri Ramakrishna Engineering College Coimbatore Mayuri H, Divya Chatty, Nagalakshmi 16th to 17th March 2018. 23 Participated in 3 day “Entrepreneurshi Awareness Camp” held in association with National Science &technology Entrepreneurship Development Board Department of Science &Technology, Govt. of India & Entrepreneurship Development Institute of India, Ahmedabad Neha R, Pooja S Danihalli, Nagalakshmi, Sushma K R 26th to 28th February 2018. 24 Participated in Diverse Developer Conference, Organized by StudyOwl Kavya M, Damini Niranjan 10th to 11th February 2018. 25 Participated in one day workshop on “Raspberry pi and python based automation system design” at IIT Madras Divya Chatty 9th January 2018. 26 Participated in Mysuru Yoga okkuta, at Mysore palace Keerthana B 28th January 2018. 27 Participated in 3 day work shop on “Challenges in Enterprise Network Security” conducted by “SLVIS Networking” Bangalore, at GSSSIETW Mysuru Shrutha K, Shilpa M S, Neha R, Shena G P, Sanjana N, Pranitha R, Pooja R, Mrudula R, Nagalakshmi, Sushma K R 29th to 31st January 2018. 28 Participated in one day workshop on “Ethical Hacking”, at IIT Madras Divya Chatty 9th January 2018. 31 Presented a paper on “ Comparitive study on Image fraud detection” State level technical symposium 2017, ATMECE Sannidhi Ramachandra, Swathi K, Vasavi D, Sahana K.V 3rd-4th May 2017. 40 Participated in the event “Paper Presentation for their paper titled “Speak-an AAC Android application”, State Level Project Exhibition Competition, Srishti-2017 held at RVCE, Bengaluru Oshin R Jacob and Sourabha K S 26th-28th May 2017. 42 Won 2nd Prize in the event “Paper Presentation” at JNNCE(Techzone-2017), Shivamoga Neha M R, Bhumica M J 5- 7th May 2017. 50 Participated in the event “Paper Presentation” at MLRIT, Hyderabad Inchara S, Yashaswini K K 5-9th April 2017. 1 Won 1st Prize in Project Presentation in TechUttkarsh Apoorva M A and Harshitha M S (V Sem) 30th and 31st October 2015 at MIT, Mysuru. 2 Won 2nd Prize in Poster Making in TechUttkarsh Sourabha K S ( V Sem) 30th and 31st October 2015 at MIT, Mysuru. 3 Won 2nd Prize in Techathon in TechUttkarsh Ranjitha C S, Meghana B R, Apoorva M A, Harshitha M S ( V Sem) 30th and 31st October 2015 at MIT, Mysuru. 4 Won 2nd Prize in Debate computation conducted by Canara bank, Mysuru on the occasion of Vigilance awareness week Sheetal S. Prasad (VII Sem) 30th Oct 2015. 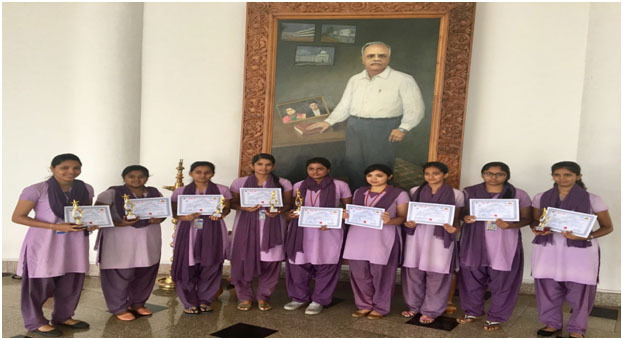 8 Won runners in Visvesvaraya Technological University Mysore Zone Table Tennis Tournament held at SJCE, Mysuru C A Anusha & Akshatha S Bhargav(V Sem) 9-11th September 2015 at AIT, Chickmagaluru. 9 Attended one day workshop on “Create and host your own website” Nayanika G N, Yashaswini, Vinyachandra H G, Kusuma S (VII Sem) Sharanya Prakash, Shambavi K N (V Sem) 12th Oct 2015 at GSSSIETW, Mysuru. 10 Participated in Visvesvaraya Technological University InterZone Badminton competition Sumaiya B H (VII Sem), Uttara A D (VII Sem) 25th Oct 2015 at NIE, Mysuru. 12 Participated in “Inter-Collegiate Climate Change Quiz” Megha Vishwanath, Gagana, Cyana D’SA, Apoorva, Harshitha M S (V Sem) Sahana Prasad, Sheetal S. Prasad, Sangeetha R Prasad, Pooja R Sethuram, Nayanika (VII Sem) 23rd Sep 2015 at IISC, Bengaluru. 13 Won 1st Prize in Social media marketing in 29th CSI Karnataka Student Convention R Nikkitha and Sourabba H S, (V Sem) 12th Sep 2015 at GSSSIETW, Mysuru. 14 Won 1st Prize in Technical Debate in 29th CSI Karnataka Student Convention Meghana B R and Oshin R Jacob , (V Sem), 12th Sep 2015 at GSSSIETW, Mysuru. 15 Won 2nd Prize in Social media marketing in 29th CSI Karnataka Student Convention Meghana B R and Ranjitha C S, (V Sem) 12th Sep 2015 at GSSSIETW, Mysuru. 2 “Business Proposal Presentation Competition- Manthan 2014”. 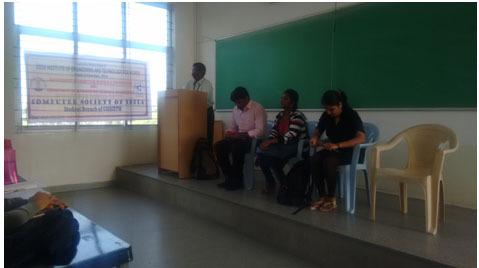 Department of Computer Science & Engineering had organized a Two Day workshop on “BUILDING INTERNET OF THINGS APPLICATIONS USING RASPBERRY PI & ARDUINO” in association with CSI Mysore and Bangalore Chapters for 8th semester Computer Science & Engineering students from 29th to 30th March 2019. The workshop was inaugurated by Dr. S. Meenakshi Sundaram Professor & Head Department of Computer Science & Engineering, GSSSIETW, Mysuru, and Workshop coordinators, Mrs. Khateeja Ambareen and Ms. Parvathi S J, Assistant Professors, Dept. of CSE, GSSSIETW, Mysuru were present. Four resource persons headed by Mr. Gowtham Raj G, Senior Application Engineer of Enthu Technology Solutions India Pvt. Ltd, Coimbatore delivered during the workshop on 29th and 30th March 2019. The workshop was organized with an objective to explore the options for development of industrial applications using Raspberry Pi & Arduino. 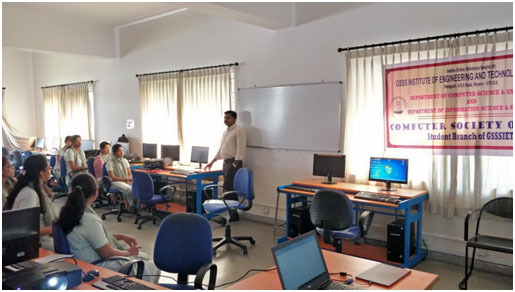 The sessions were conducted by Mr. Karthik S, Hardware Engineer, Mr. Gowtham Raj G, Senior Application Engineer Mr. Praveen Kumar R, Software Engineer and Mr. Sathish Kumar R of Enthu Technology Solutions India Pvt Ltd, Coimbatore on 29th and 30th March 2019. 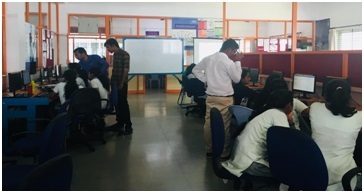 The workshop included hands on sessions which gave the students insight into various approaches to industrial applications using Arduino and Raspberry. Day 1: The session started with the introduction of "Raspberry Pi & Arduino". Detailed information on Wi Fi Sensor Node Applications (LED, Switch and Sensor Interfacing), Data Monitoring using Wi Fi Sensor Node and Wifi Sensor Node and Device Control using MQTT using Wi Fi Sensor Node were taught to the students. LoRa IoT Development Kit was introduced to the students. The configuration of Gateway, registering Gateway with LoRaWAN Server, LoRaWAN Communication using LoRa Shield and LoRaWAN Communication using LoRa GPS Shield were explored by the students during the workshop. Day 2: The session started with the introduction of Python Programming Language and hands-on sessions with Raspberry Pi and ETS-IoT Kit was provided to the students. 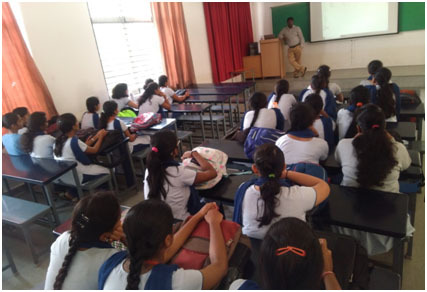 Applications of On Board Peripherals and Sensors, Interfacing Peripherals with I/O Expander Pins, Interfacing Peripherals with direct Raspberry Pi pins and Interfacing Digital Sensors with ETS-IoT Kit (IR Sensor, DHT11 Sensor, Ultrasonic Sensor) were provided to the students. Hands on sessions on Interfacing Analog Sensors with ETS-IoT Kit (LDR, Soil Moisture Sensor, Rain Sensor), Interfacing Servo Motor with ETS IoT Kit ,Data Monitoring using IoT cloud platform with ETS IoT Kit,Device Control using MQTT in ETS IoT Kit,Bluetooth Application with ETS IoT Kit were provided to the students. Certificate Distribution : Dr. S Meenakshi Sundaram, Professor and Head, Department of Computer Science & Engineering and Mr. Gowtham Raj G, Senior Application Engineer of Enthu Technology Solutions India Pvt. Ltd. handing over participation certificate to one of the participant. The Workshop concluded with the valedictory function where all the student participants were present. Participation Certificates were distributed by Dr. S Meenakshi Sundaram, Professor and Head, Department of Computer Science & Engineering and Mr. Gowtham Raj G of Enthu Technologies India Pvt. Ltd., Coimbatore. Students provided their feedback and the suggestions for improvement was considered for future workshops of the similar kind. 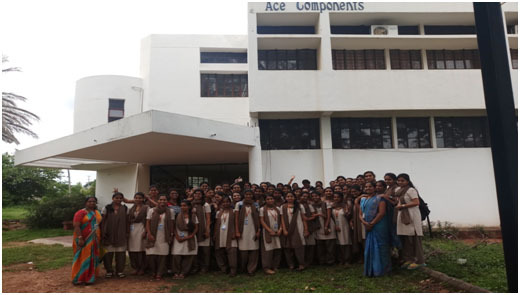 The students expressed their learning experience and were confident in addressing the recent challenges in IoT by building Industrial applications using Raspberry Pi and Arduino. 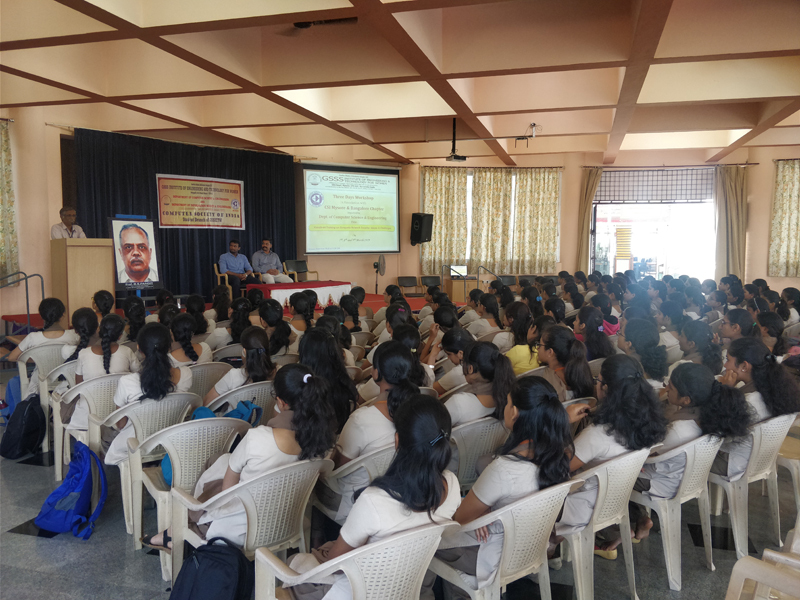 Department of Computer Science & Engineering had organized a Three Day Workshop on “Hands-on Training on Computer Network Security: Issues & Challenges” in association with CSI Mysore & Bangalore Chapters for 6th Semester students of CSE on 07th, 08th, & 09th March 2019. The Program was inaugurated by resource person Mr. Pradeep G, Principle Solution Adviser, Cisco Systems, Bengaluru in the presence of Dr. S Meenakshi Sundaram, Professor & Head, Department of CSE, GSSSIETW, Mysuru, Mr. Vishwesh J, Asst. Professor, CSI Forum Coordinator, Department of CSE, GSSSIETW, Mysuru, Mrs. Shruthi B M, Mrs. Asha Rani M, & Mr. Parashivamurthy B M, Asst. Professor’s & Workshop Coordinator’s, Department of CSE, GSSSIETW, Mysuru. The pre-workshop talk was given by Mr. Pradeep G, Principle Solution Adviser, Cisco Systems, Bengaluru by providing the brief introduction about the issues and challenges we face in the present network environment. The session on day one started with the introduction part of the "Challenges in Enterprise Network Environment". Detailed information on the layers of a network model, types of network address, routing, switching and how routers & switches work in a network was explained. The session 1 ended with students being given introduction about Packed Tracer and its significance. The afternoon session started with hands-on by performing the command's on how to configure the routers, switches, PC’s. The students were provided with the knowledge about how to work on static routers on IPV4. The session ended with students working on those commands. The session on day two started with the introduction about the VLAN, how to operate those VLAN connections, different types of switching ports. This session continued with hands-on by performing the commands for the operation of VLAN. The session ended with students been given the assignment to perform that how to create network topologies and imitate modern computer networks using Packet Tracer. Session on the second day. The session on day three began with the introduction about the Inter VLAN routing, how to operate those VLAN connections and how do hosts in one VLAN communicate with hosts in another VLAN. The afternoon session started with explanation of Routing in IPv4 Network. This session continued with the students being provided with the knowledge about how Static Routing and Dynamic IP Routing works and Dynamic Routing Protocols like RIP v1, RIP v2, OSPF and EIGRP with examples. Session continued with explanation of IPv4 to IPv6 Transition and how Routing of IPv6 packet in IPv4 Network was demonstrated. The workshop was much appreciated by the students with many of the enthusiastic participants sharing their experience on how the workshop enlightened them about the Challenges in Enterprise Network Security. Miss. Prerana K Urs of CSE 6 th semester B section student won in the final round during the Inter-collegiate Quiz competitions, organized by CSI – Mysore Chapter held on 12 th March 2019. She was crowned as “Ms. CSI – Mysore” and was awarded with a cash prize of Rs. 5000/-. 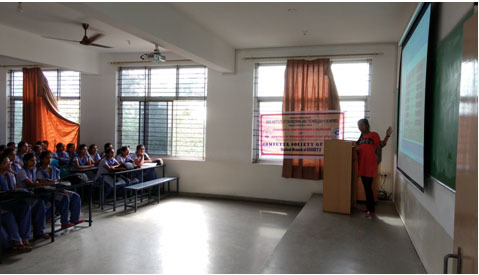 The Quiz competition was held at CIIL (Central Institute of Indian Languages), Mysuru. 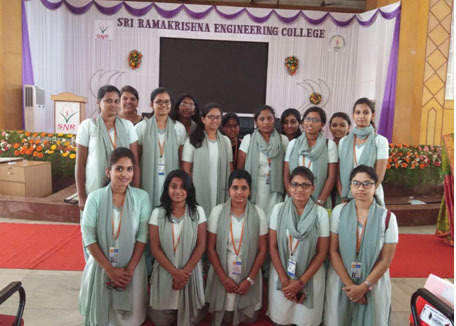 14 participants from 7 Engineering Colleges in Mysuru who were short listed for the final round by the Colleges attended the competitions. Among the 14 final round quiz contestants from 7 Engineering Colleges across the Mysuru City, Miss. Prerana K Urs was declared as the winner as “Ms CSI – Mysore” with a cash award of Rs. 5000/-. Students of 6th Semester CSE attended the “CSI National Level Student Convention” organized by CSI Student Branch of Sri Ramakrishna Engineering College (SREC), Coimbatore on 16th & 17th of March 2018. The students participated in the events like Paper Presentation, Coding, Technical Quiz, Treasure Hunt, Web Designing and Star of the Event, out of which 5 students won the prizes. The management, Principal, HOD, Staffs & Students of Department of CSE congratulated the winners of various events. Divya Chatty won 1st Prize in Technical Quiz, Star of the Event and 2nd Prize in Coding, Aparna S Bandekar won 1st Prize in Technical Quiz, Sushma K R & Srishti Maru won 2nd Prize in Treasure Hunt, and Simran Goyal won 3rd Prize in Coding. Resource person Mr. Pradeep G, Network Security Consultant and Corporate Trainer, SLVIS Networking, Bengaluru interacting with 6th semester students on 29th, 30th & 31st January 2018. Resource person Mr. Krishna Reddy B.G, Corporate Trainer (IBM Oracle, Honeywell), interacting with 7th semester students on 21st, 22nd, and 23rd August 2017. Technical Talk on “Information Process Technology and Outcome by Praveen Natrajan” on 10th March 2018 for 2nd Sem CSE Students. Resource person Mr. Neeraj Kumar Singh, Managing Director, TM Square Technology Solutions, Bengaluru interacting with 4th semester students on 10 th February 2018. 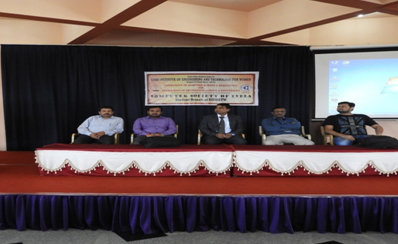 Department of Computer Science & Engineering had organized a Three Day Workshop on “Challenges in Enterprise Network Security” in association with CSI Mysore Chapter. The Program was inaugurated by resource person Mr. Pradeep G, Network Security Consultant and Corporate Trainer, SLVIS Networking, Bengaluru for 6th Semester students of CSE on 29th, 30th & 31st January 2018. Three Days workshop on “Android Application and its Security” in association with CSI Bangalore and Mysore Chapters was inaugurated by resource person Mr. Pankaj Kumar, Managing Director and CEO, Emporis Software Solutions LLP, Bengaluru, Mr Ashish Kumar, Android Developer, Emporis Software Solutions LLP, Bengaluru and Mr. Gowtham N, Android & IOS Developer, Emporis Software Solutions LLP, Bengaluru for 4th semester Computer Science & Engineering students from 23rd to 25th January 2018. Technical Talk on “Android Studio” on 10th September 2016 by Karthik G, VSG Software Solutions, Mysuru. Hands-on session by Karthik G, VSG Software Solutions, along with V semester students. Technical Talk on “Unix Shell Scripting” on 24th September 2016 by Madhusudan CK, Senior Software Engineer. Alcatel-Lucent, Bengaluru. Technical session by Madhusudan CK, Senior Software Engineer, Alcatel-Lucent, Bangalore, along with III semester students. Technical Talk on “Oracle Apps (Warehouse System Management)” on 08th October 2016 by Praveen Natrajan, Senior Software Engineer, SPI, Mysuru. Technical session by Praveen Natarajan, Senior Software Engineer, SPI, Mysore, with VII semester students. Technical Talk on “Brief Overview on 2G/3G Communication” on 22nd October 2016 by Shamila L, Technology Consultant, HP, Bengaluru. Technical session by Shamila L, Technology Consultant, HP, Bangalore, along with V semester students. Three day workshop on “.Net Applications” on 07th to 09th November 2016 by Sumal Raj M, Chief Executive Officer, Inov-Tec Software Solutions, Mysuru. From Left: Dr. S. Meenakshi Sundaran, HoD, Dept. CS&E, Sumal Raj M, Chief Executive Officer, Ramya S, Senior Software Engineer and Nayanika, Software Engineer, Inov-Tec Software Solutions, Mysuru. 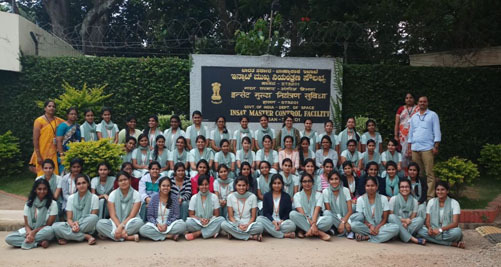 Almost 20 students from the Computer Science & Engineering department had attended a “30th CSI Karnataka Student Convention at KSIT, Bengaluru” on 10th, 11th & 12th November 2016 and participated in the events like Paper Presentation, Quiz, Sudoku, Pic-Story, & Bug-Me-Out and own many prizes. The Information System Security Association (ISSA) ® is an industry-led, International Organization of Information Security professional and practitioners. ISSA was established in 1984 and now comprises 13,000 cyber security professionals, 150 chapters across 70 countries worldwide, ISSA is the community of choice for international cyber security professionals dedicated to advancing individual growth, managing technology risk and protecting critical information and infrastructure. ISSA Student Chapter was inaugurated at GSSSIETW, Mysuru on 11.10.2018. Mr. Ganesh Shankar, Founder & CEO, FluxGen Technologies, Bengaluru was the Chief Guest for the function. Dr. A.M. Sudhakara, System Head, Computer Centre, University of Mysore was the Guest of Honor for the function. He handed over the ISSA Institutional membership Certificate to the Principal, Dr. M. Shivakumar on this occasion. 134 Student members who enrolled themselves as ISSA Student members were issued Student Membership Cards by Dr. A. M. Sudhakara. In the inaugural address Dr. A.M. Sudhakara, briefed about cyber security and how cyber security can give protection to the internet-connected systems, including hardware, software and data, from cyber attacks. He highlighted about the different types of cyber security threats like Wannacry Ransomware, Malware and Phishing. Also he shared about the recent job opportunities created for cyber security professionals. The Department of Computer Science and Engineering organized this event. Dr. S Meenakshi Sundaram, Professor & Head, Department of Computer Science & Engineering, GSSSIETW, Mysuru, and Dr. Nandakumar A N, Professor, Department of Computer Science & Engineering, GSSSIETW, Mysuru were present during the inaugural function. 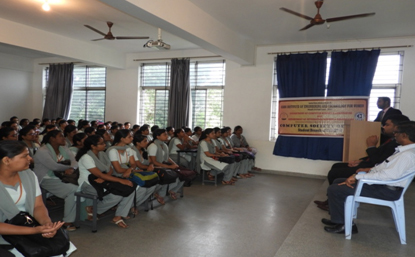 127 students from CSE Branch and 07 students from ISE Branch were enrolled as student members of ISSA. Three Days Workshop on " Arduino Development Environment with Android Mobiles"
to perform that how to create network topologies and imitate modern computer networks using Packet Tracer.